After a beautiful summer season, fall is here. Use your interactive whiteboard to get your students involved in the most colorful season of the year, by introducing some fun themed activities. Choose from these popular Gynzy activities that cater to a variety of academic subjects and grades, and are sure to bring a little fall spirit into your classroom. What could be more fun than a lesson about fall? Use this fall theme board to talk about fall. With the Fall Scene activity children are provided with a colorful landscape, filled with interactive elements to get them interested in the coming season change. 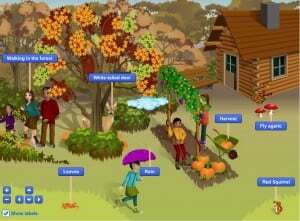 Students get to explore the fun scene depicting a beautiful fall day, and can click on different aspects of the image to learn more about what they see. 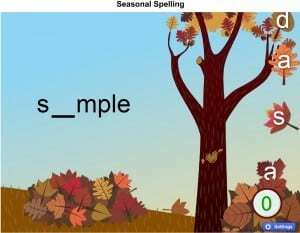 With Seasonal Spelling students can catch falling letters and use them to complete words. Words appear on the left side of the screen with one letter missing. Random letters begin to fall on the right side of the screen. Do you see a falling letter that is missing from a word? Grab it and drag it to the blank in the word. Your students will love this seasonal game! You can create a word list or select one that you previously saved via “Settings”. Here you can also configure the activity by selecting the interval seconds, the number of words to be visible simultaneously during the activity, the order in which the words appear and the season. 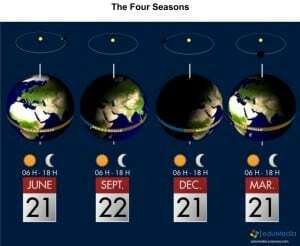 This is a 2 minute long animation about how the earth’s tilt causes the four seasons. You can use the pause button to pause the animation. During the pause you are able to ask your students questions or give some extra explanation. This activity is aimed at teaching younger students about words related to fall from four different angles. 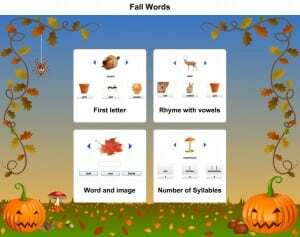 Fall Words includes activities on matching words with images, identifying rhyming words, identifying letters in each word, and counting syllables. Use these games one at a time or let your students choose which activity they would like to play!